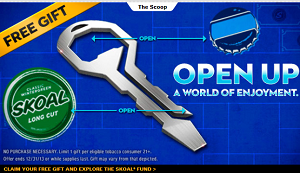 Get a FREE Skoal Bottle Opener! Must be 21+ to enter the site. This offer is back again and available while supplies last. THANKS! ENJOY YOUR NEW BOTTLE AND CAN OPENER. SHOW YOUR LIDS NO MERCY. Please allow 10-12 weeks for your gift to be delivered and be sure to come back for next month’s coupons. Another goodie to surprise the hubby with 🙂 even though I hate his nasty chewing habit lol! Thank you H4F!!!! !